James Kilbreth, an attorney for ranked-choice voting supporters, argues before the Maine Supreme Court in April. Supporters of Maine’s first-in-the-nation ranked-choice voting law say they could launch a people’s veto effort to keep the initiative alive. While approved by voters last fall, the law ran into constitutional problems, and could be scuttled by the Legislature. The threat of a people’s veto adds another layer of complexity to a political stalemate. The ranked-choice voting law ran into a legal problem. 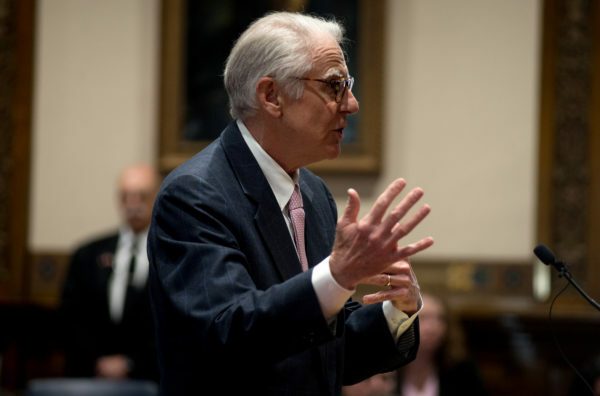 After it was approved, the Maine Supreme Judicial Court issued an opinion finding that the law was unconstitutional for use in general elections for governor or the Legislature. Kyle Bailey with the Committee for Ranked Choice Voting says his group would accept a bill that implements ranked-choice voting for elections other than those. “If they choose not to do so, certainly supporters of ranked-choice voting have the option to do a people’s veto to repeal the Legislature’s repeal and to restore the ranked-choice voting law as enacted by voters,” Bailey said. If the group decides to launch a people’s veto effort, it will have to gather more than 61,000 signatures. And it could mean that the state will have to implement the new system for at least one election — the June 2018 primaries. Voters could be deciding at the very same time whether they want to keep ranked choice. “If [the people’s veto] went on the June ballot we would have to implement ranked-choice voting as if nothing else had changed. It would be in a pretty strange climate of uncertainty,” says Secretary of State Matt Dunlap. Dunlap says that will all depend on when, and if, ranked-choice voting supporters submit their people’s veto signatures. By law, any people’s veto effort has 90 days from adjournment of the Legislature to collect the necessary signatures. If the signatures are collected quickly, then it’s possible the people’s veto would appear on the November ballot. But if the signature drive drifts past Aug. 26, it could get kicked to the June primary, because state election officials have to close the November ballot 60 days before the election. And, because a people’s veto automatically halts the law it seeks to repeal, state election officials would have to implement ranked-choice voting. Dunlap says that potential outcome has caused heartburn for lawmakers who are already opposed to a partial implementation of the system. But from the perspective of ranked-choice voting supporters, a people’s veto may be the only way to save the system from being repealed altogether.